Gary Hill’s place in the pantheon of contemporary video art is attested to by his many awards and exhibitions — a Golden Lion at the Venice Film Festival in 1995; participation at the Documenta IX in Kassel; solo exhibitions at MOMA in New York, at the Pompidou Centre in Paris etc. Hill’s early video art works researched the synthesized image, which was made with experimental video equipment, capturing objects in such a way that their perception conflicts with post-minimalist or conceptual postulates, for example, Hole in the Wall, (1974). Later, Hill took an interest in contemporary poetry, and text began to play a central role in his work and in the relation between image, rhythm, and the sound narrative, such as Surroundings, (1979), as well as Around and About, (1980). Maurice Blanchot’s idea that language influences phenomenological experience is reflected in Hill’s work. 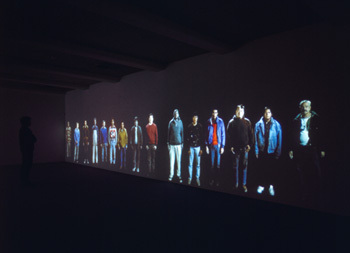 His more recent works such as Viewer, (1996), and Blindspot, (2003), we see that the person is the hero. The artist is interested in the relationship between the viewer and the hero, which is signified by emotions and signs produced with the help of video equipment. Here, we see the artist turn to the theme of the “Other,” relying on the texts of the philosopher, Emmanuel Levinas, which has been used often in contemporary art. The video portraits of people began to touch the human and emotional factor, and are subjected to dialectical analysis of people on both sides of the screen. The main theme of Hill’s oeuvre is researching the relationship between word, sound, and the electronic image. In essence, Hill’s work is based on structural analysis and deals with the problems of the essence of text. Nevertheless, text is mostly dealt with in a post-modern way, as a way to depict the surrounding world. The video image separates the subject reality into its semantic and material components. Hill shows the divergence between the spoken word, the visible subject and the present reality of this subject, which actually has little in common, and are tied together only in human consciousness. GMG Gallery will show Hill’s most significant works, which were chosen mostly because of their educational use for the Moscow public. One of the works has never been seen before and most likely will be a world premier made especially for Moscow. Media Forum is the most avant-garde program at the Moscow Film Festival, and is dedicated to new and experimental forms of screen culture. The Media Art Lab Center for Arts and Culture has introduced multi-media culture to the Russian public for 11 years, organizing exhibitions of the best video artists and their master classes, lectures and round tables, as well as sound art and net art, and all that is new and cutting-edge in contemporary art. GMG Gallery is one of the youngest galleries on the Moscow art scene, but in its three years it has shown projects by Yoko Ono, Bill Fontana, Thomas Joshua Cooper, as well as exhibitions of the classics of Moscow conceptualism, and important Russian and western young artists who participate in the most progressive art forums in the world. A showing of Gary Hill’s works, as well as his master class, will be on June 20 at 20.00 at the Garage Center for Contemporary Culture.